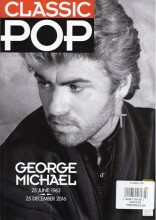 Features an incredible slew of MAGNIFICENT photos of GEORGE MICHAEL and more! A MUST for any GEORGE MICHAEL fan or collector!! GEORGE MICHAEL Heal The Pain UK 12"
GEORGE MICHAEL AND MUTYA This Is Not Real Love UK 12"
Click the button below to add the GEORGE MICHAEL Classic Pop (2-3/17) UK Magazine to your wish list.